Today, Google is announcing the launch of SketchUp 7 and SketchUp Pro 7, the newest versions of our popular 3D modeling software. Whether a user is an architect drafting solar-powered buildings, a video-game designer imagining wild characters in new worlds, or is entirely new to 3D and discovering the basics, SketchUp 7 makes design easy and more intuitive than it has ever been. With many useful new features, SketchUp 7 will not only help users express their ideas better and more easily in 3D, but will allow them to share their work and collaborate more effectively as well. The creative and technical challenges of 3D can be daunting, and may prevent great projects from ever getting started. SketchUp 7 includes new features designed to make modeling more intuitive, help beginners get going, and enable veteran designers to work more efficiently. Available in both SketchUp 7 and SketchUp Pro 7, Dynamic Components are 3D models that are aware of what they are and behave like the real-world objects they represent. A ‘dynamic’ staircase, for example, knows that it is a staircase, and not just a shape designed to look like a staircase. Using the Scale tool on this staircase will automatically add or remove steps as you make it bigger or smaller. Dynamic Components allow modelers to scale objects without distorting them, configure ready-made components, and simply animate the objects. SketchUp 7 and SketchUp Pro 7 were designed to make it even easier to share ideas and finished work with other SketchUp and modeling enthusiasts, wherever they may be in the world. Now, the Google 3D Warehouse, an online database of millions of 3D models, can be searched from within the SketchUp 7 component browser, making the process of finding, downloading, and using existing models of anything from the Golden Gate Bridge to a dining room table, even easier. As designs in SketchUp become more collaborative, taking and attributing credit for these models becomes increasingly important. Credits ensure that modelers’ work will be recognized and helps all users better understand the history of design behind each model. There are additional powerful features for SketchUp Pro users. LayOut 2, now out of beta, is a tool for creating and sharing professional presentations made from SketchUp models. 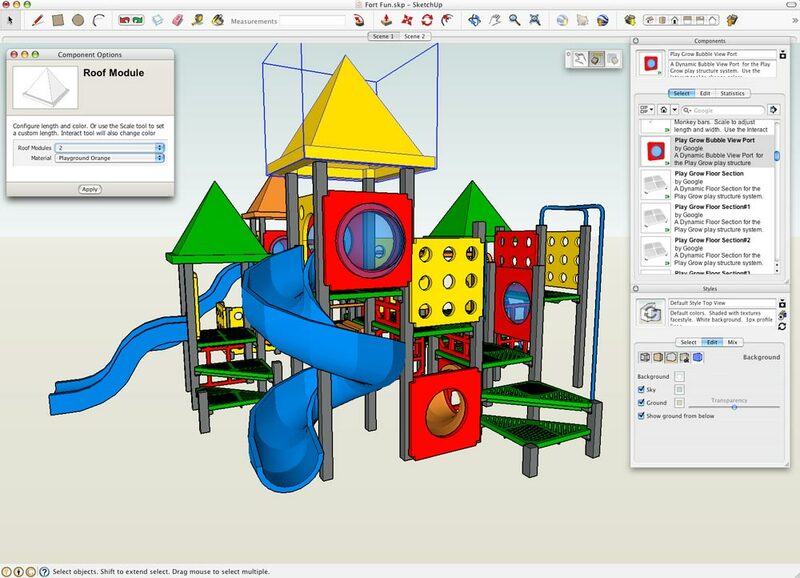 LayOut 2 allows users to share hard-copies of their work and transfer models from SketchUp to paper, enabling them to print 3D items in a newly dynamic and detailed fashion. 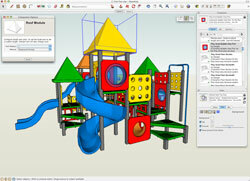 SketchUp Pro 7 users can author their own Dynamic Components, creating their own fully customized, interactive 3D models. SketchUp Pro 7 can be purchased online for $495. Want to learn more? Download SketchUp 7 at sketchup.google.com and give it a try. Also, have a look at the Official Google Blog and the Official SketchUp Blog for posts from Aidan Chopra, SketchUp Product Evangelist. Happy modeling!